“Shorten your rein, grab mane, prepare to canter,” came from plucky Lari Shea, owner of Ricochet Ridge Ranch. Mounted on a Black Beauty double named Rascal. This petite lady leads countless horse treks through the primordial redwood forests of Northern California. I tried not to think too much about the turkey vultures wheeling overhead or the growing chasm between me and a soft landing and focused on the footing of the trail as the white-fringed Pacific fell away. 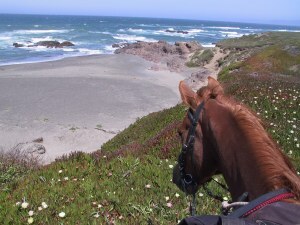 The brisk canter took us through a frilly fern forest and we splashed through a gurgling creek to a grand vista that is best reached on horseback. My mission is to enjoy as many beautiful places as I can before they are no more. Horseback riding allows me to get into the scenery, away from police sirens and cell phones, and to get in tune with the rhythms of nature. 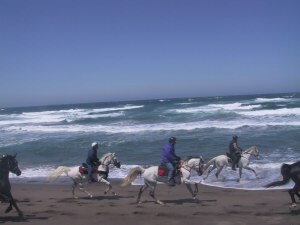 So, when I found one of the last best riding opportunities in California on the Internet and saw that Lari offers everything from slow ambles though gorgeous scenery for the novice, to week long “real deal” rides on fit endurance horses for experienced riders, I was eager to get in the saddle. Lari has been winning endurance races since 1966. These are grueling 50 to 100-mile scrambles through rough terrain that must be completed in a 12 or 24 hour time frame, respectively. She runs her ranch with 55 horses and a dozen guides with the same strict precision she applies to her racing. 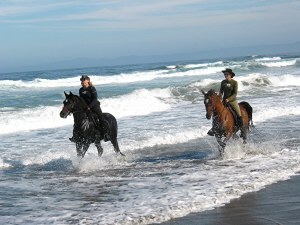 She offers week-long rides through the redwoods, custom rides tailored to suit your schedule and riding abilities, as well as a string of combination rides with the cooperation of local innkeepers. I chose the combo that seemed perfect for the mature rider; a relaxing three night stay at the tranquil De Haven Valley Farm contrasted by two days of fast, challenging riding. I found the country inn and restaurant, built in 1875, tucked in a sheltered valley off Union Strand Beach. 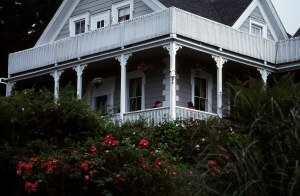 It’s easy to miss this last opportunity for good food and cozy lodging before entering the ragged edge of the Lost Coast. Guests here enjoy delicious meals prepared with fresh ingredients grown on the farm. While owner Bill plays his interpretation of the ocean sounds on the piano, his partner, Michael, plies visitors with exceptional local wines. After a four-course set-dinner, guests gather by the fire to share their day’s explorations. There are no televisions here to distract from gentle conversation in the old-fashioned parlor. Activities range from birds sightings at De Haven Creek, a walk along the bluffs overlooking a turgid sea, a hike on the well-maintained trails that lace the twenty-acre farm, or a stroll through the gardens with heavy-headed blooms tossing in the sea breeze. After a leisure rise and a hearty country breakfast, I began my full day ride through a shady draw beneath towering redwoods. Our energetic horses charged up a steep slope thick with devils club then sashayed into a dell where a creek whispered to us from a moss-laden ravine. This is the home of a 1,500-year old giant that towers over the forest gilded with columns of light. This granddaddy of all the trees on the mountain was here when Columbus landed in the Americas and, with luck, will be spared the logger’s axe and continue to live for another 1,000 years. Another climb brought us back into the sun and a view of the blue pacific wearing a lacy white skirt. We trammeled through knee-high, velvet grass meadows spiked with white daisies and red columbine. In May the shoulder of the mountain is cloaked in royal purple Iris and gold fields. The crystalline air and endless blue sky livened horse and rider alike. Our group of seven, a mother and daughter team, two guides in training, Lari, her husband Harvey and I, moved briskly through tree tunnels shrouded in wild cucumber vines. Mats of sorrel, trillium and miner’s lettuce thrive on the cool forest floor beneath the canopy of bishop pine, Douglas fir, spruce, and coastal redwood. A majestic stag standing in a shaft of sunlight upon a ledge above us was completely unmoved by our caravan. This ride is on private land where he remains Lord of the Forest. “It’s so great to ride the trails in an English saddle,” chirped the young blond studying to be a doctor at USC. “Hardly any of the outfitters offer that anymore,” she said, flushed with excitement. I opted for an endurance saddle that provides a more stable seat with English stirrups that allow the rider to comfortably post to the trot. Western saddles are also available. All the gear was in excellent condition. All of the horses on our ride were Arabs except my mount, Dakota, a six-year-old quarter horse. Lari specializes in an Arab-Russian Orlov trotter cross that she breeds for her endurance rides. This mixture produces horses with a ground eating stride, sure-footedness and a relaxed disposition. All of our mounts were well-groomed and their hooves recently trimmed and shod. 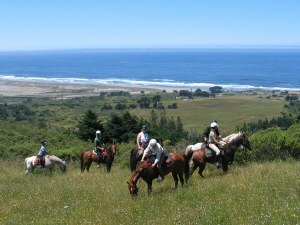 “These horses really are incredibly fit,” came from the girl’s mother, a veterinarian from Davis, as we trotted up to a ridge trail no more than 30 feet wide with vistas on either side. To the right velvet green forested slopes. To the left, the shimmering blue sea with a ten-mile strand of sand that would be our destination in the morning. “This trail was used as a trade route for the Pomo Indians. The indigenous people weren’t stupid. They didn’t live in the rain, wind and fog that goes with living on the coast. They traveled to the other side of this mountain,” Lari explained, as she snipped overgrown limbs shrouding the less-traveled track. An estimated 250,000 Native Americans lived in the region at the height of the culture. They engaged in extensive trade with neighboring tribes, and carried as much as a hundred pounds of goods strapped to their foreheads over this ridge that is part of the California Cultural Trail. I don’t know if this reflects superior intelligence, or exceptionally thick skulls. After a thrilling two-mile canter up a narrow,winding path that wraps the mountain, we gave the horses a breather. While the horses regained a proper pulse and respiratory rate, Lari gave pointers on how to check their vital signs. Lari’s extensive knowledge of horse anatomy and a genuine regard for her animals makes her a superior rider. She wins her races with a tortoise and hare philosophy that requires paying strict attention to the needs of her mount. She is fond of saying that she wins by going slower than her competition, leaving them behind at the vet check stations as their horses struggle to recover from over-exertion. Over a picnic lunch, we talked about why the North Coast has escaped over-development. Convenient to nowhere, it is best reached by Highway 128 off of the 101 about 140 miles north of San Francisco. This lovely byway purls through oak woodlands and Anderson Valley wine country then dips down into cool cruise through a large stand of redwood to connect with curvaceous Highway One. A staunch environmental stand on the part of locals and a vigilant Coastal Commission prevents developers from corrupting this shoreline with strip malls and condos. Huge swathes of land are preserved, and the rest is owned by large timber interests. Mother Nature has given a helping hand in the form of wildfires. Westport, about a mile south of De Haven Valley, had a population of 10,000 and was once the largest city between S.F. and the Oregon coast until it was leveled by fire. All that remains is a market-deli that builds superlative sandwiches to suit for day-trippers. With little industry, the region has become an enclave for artists living in rustic hideaways competing for the biggest profusion of blooms in their gardens. After a few stretches to ease stiffness on the ride home, we ambled down the mountain. I high-tailed it back to De Haven where I could settle into the spa beneath of swath of stars. I sidestepped up the stairs to the hot tub overlooking the depths of the valley, slipped into the steamy brew, and prayed my muscles would forgive me in the morning. De Haven proved to be the perfect antidote to my 25-mile ride. I must have won my stripes on Dakota, who kicked up his heels on more than one occasion on the full-day ride, because Lari gave me “Ricki,” short for Ricochet, for the beach outing. At seventeen, she is super fit, bomb-proof, trained in dressage and extremely sensitive to the aids. In fact, Lari plans to ride her in her next 50-mile race. Ricki’s ears perked at the sound of the waves, and her pace quickened with the smell of the salty spray off frothy waves rolling in sets of seven. Eager to get on with her workout, she pranced through the fog hugging the shore. The untamed surf on the North Coast breaks hard on jagged sea stacks, but here for ten miles at MacKerricher State Park there is hard packed sand and a perfect spot to ride. Vast dunes draped with beach morning glory have formed here that can reach 130 feet in height. Tucked behind mountains of sand, endangered species like nesting plover find protection from the ceaseless wind off the sea. Many shorebirds, including osprey, congregate here at Cleone Lagoon at the mouth of Ten-Mile River. We stopped to check out sea lions sprawled on a rock ledge with their young. Our guide for the day was generous with riding tips to ensure our safety before allowing us to canter on. 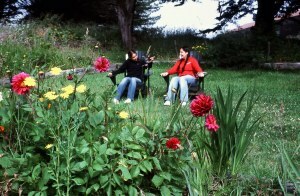 Ricki found her rhythm, and we settled into a rocking chair lope. A flock of willets lifted at our approach. As we flew into a windy world shrouded in mist, minutes passed and years dropped from this aging cowgirl. I was an endurance rider on a horse with the stuff to win races against the best of them. Thanks to Lari’s thirty years of building relationships with local innkeepers, like the owners of De Haven Valley Farm, forest officials, and wealthy landowners that allow her to take riders into pristine forests on trails, and her passionate regard for her animals that keeps them well-trained and conditioned, it’s not too late to get in on this not-to-be-missed riding adventure.